Ed Palmer explains the finer points of hedge trimming to Paul Epsom. 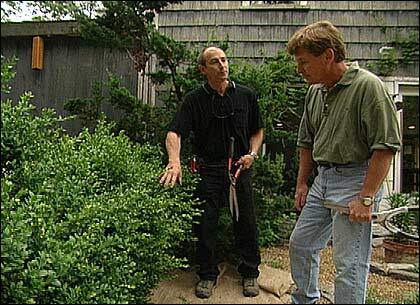 Paul Epsom got a lesson in proper techniques for manual hedge trimming from veteran trimmer Ed Palmer. To begin with, Ed says far and away his tool of choice is a traditional pair of hand shears. He says these give the best control and when used properly, they don't require as much time and effort as you might think. According to Ed, most people tend to hold the shears incorrectly, standing in front of and back from the section they're cutting with their hands positioned side by side. But since most of the trimming happens along the length of the hedge, this method leads to uncomfortable body mechanics and an unhelpful point of view for cutting in a straight line. Instead, Ed recommends gripping the shears from the side (for a righty, that's right hand on top, left on the bottom), so that you can stand at one end of the line you plan to trim along and work your way forward. By "throwing" the shears ahead you can more easily make straight, steady cuts while keeping a clear line of sight as you go. Ed demonstrates the correct method of holding and "throwing" the shears. Another common hedge trimming mistake results from an unwillingness to cut the younger, more vigorous growth at the top of the hedge. Ed notes how you often see hedges that are thick and bushy on top but thin towards the bottom, because as the bottom becomes shaded from the growth at the top, it begins to die away. Since often a hedge's primary purpose is to provide a visual screen, this is not ideal. What you want of course is a hedge that's healthy and green from top to bottom. To achieve that Ed says you should trim the plants so they're wider at the bottom than the top, allowing the faster-growing tops to catch up with the bottoms. 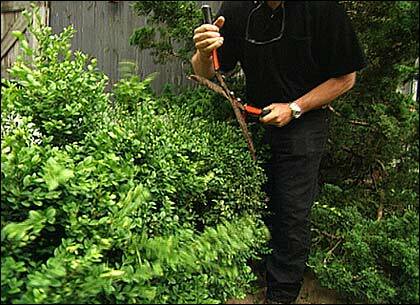 Resist the temptation to square up the bottom, as they won't recover from pruning as quickly as the top. 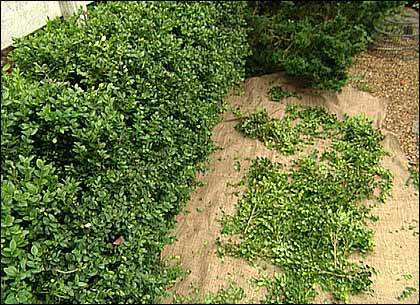 Especially if your hedge borders on gravel, as this one does, put down a tarp before trimming so it's easier to dispose of the clippings. For a natural look, finish the job by trimming along the top surface of the hedge, removing the heaviest wood with a small pair of hand pruners. Ed also emphasizes that your overall approach will depend on whether you desire a natural or more formal look for your hedge. If a formal sheared appearance is what you prefer, remember also to make some deeper cuts to thin out the interior growth of your plants; leave that step out and you'll begin to lose that foliage altogether due to the uniform density of the exterior. Finally, a note on when to prune. The answer depends again on what your aims are for the look of your hedge. The earlier in the year you trim the plants, the more likely you are to stunt their growth; that's because you're essentially cutting away most of the plants' stored energy from the previous year. So if you want a low hedge, prune early, then again several times throughout the season. If you want a larger, bushier hedge, wait till later in the growing season to make your first cuts and prune more rarely thereafter.